“It’s Showtime!” are two of the most polarizing words in New York City public transit, but in Bill de Blasio’s town, the performance that follows is going the way of the peep show. 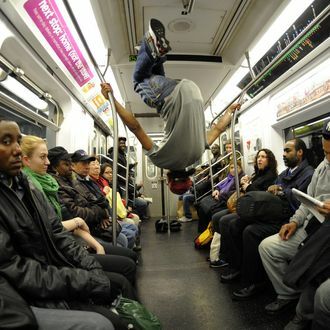 That’s the plan, at least: NYPD Commissioner Bill Bratton’s continued crackdown on beat-boxing subway acrobats has resulted in more than 240 arrests so far in 2014, six times the amount at this time last year. “Is it a significant crime? Certainly not,” admitted Bratton, who subscribes to the “broken windows” theory of policing, in which low-level shenanigans are stamped out before they can blossom into violence and anarchy. “Does it have the potential both for creating a level of fear as well as a level of risk that you want to deal with?” he added. Um, maybe? Or … it doesn’t have to be! “We all, as New Yorkers, get these force fields around us,” said one performer. “We just try to go inside the train and change the vibe.” But nothing changes the vibe back to tense and adversarial like arresting a teenager for dancing.